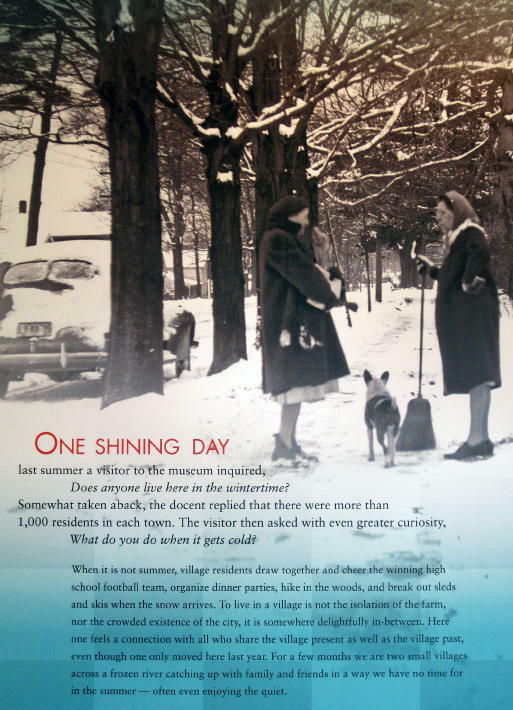 This year's exhibit at the Saugatuck-Douglas Historical Society's Pumphouse Museum examines daily life from the perspective of working citizens in the community between 1890 and 1950. 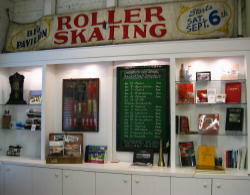 The museum is now open daily from noon to 4pm though Labor Day and then on weekends through October. 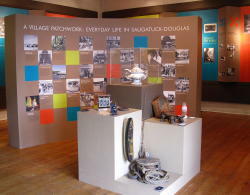 Titled "A Village Patchwork: Everyday Life in Saugatuck and Douglas", the exhibit pulls together an array of photographs, artifacts and stories to depict the cross-currents of daily working and living that characterized our formative years. Jim Schmiechen, museum curator said the most dramatic items are the Bird Drug Store pharmacy book and the "Hutchins Fruit and Vegetable Assorter." Patented in 1891 by H. H. Hutchins, the Assorter has been beautifully preserved. 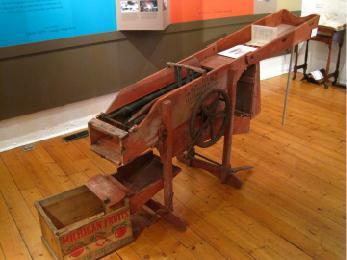 Used for sorting fruit and vegetables, this complex machine is still in working order. Using gravity the device clears away orchard debris, and grades produce into pre-set sizes ready for packing. "The objects allow people to come into contact with the past in a real way," Schmiechen said, "Historians usually write stories. Museums tell stories of the past using images and objects. It's a way of enabling people to use the past to interpret the present." The exhibit, designed by Society volunteers Judy Hillman and Sally Winthers, celebrates a variety of fall, spring and wintertime snow-related activities that do so much to reinvigorate personal relationships and preserve community traditions, including the fun of cheering our almost-championship High School football team of 2010. Highlighting the exhibit is a centerpiece curved wall presenting drawn birds-eye views of both Saugatuck and Douglas, detailing streets and structures as they existed in 1907. Among the exhibit's historical curiosities are a Bird Drug Store pharmacy book, milling, architectural and logging tools.